Don’t go to some overpriced hipster dive for brunch to try and prove you’re cool. Ain’t nothin’ cool about spending that kind of money on pancakes that taste like burlap and body odor. 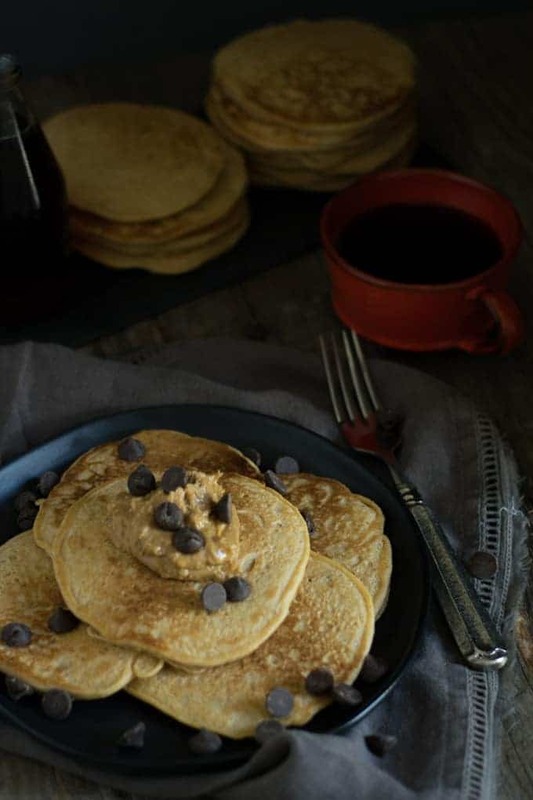 Stay home and make these Homemade Peanut Butter Pancakes. It’s time to throw that box of Bisquick crap in the trash! That $#[email protected] is weak. And, it’s also unhealthy. But, don’t worry. Because I’m about to give you healthy, easy, delicious, and awesome all rolled into one. And, you can do it with 7 ingredients and 15 minutes of your time. So far, so good? Well, keep reading because it only gets better. Hey, I know it doesn’t take some creative culinary genius to throw peanut butter into the pancake mix. But, who cares? Still awesome. And, there ain’t no points for complicated. But, there is some sweet lovin’ from the wife because I got up early and made something delicious and healthy for the kids. My family thinks I make the best pancakes and I tend to agree. So, any time I can take it up a notch and impress them – I do it. 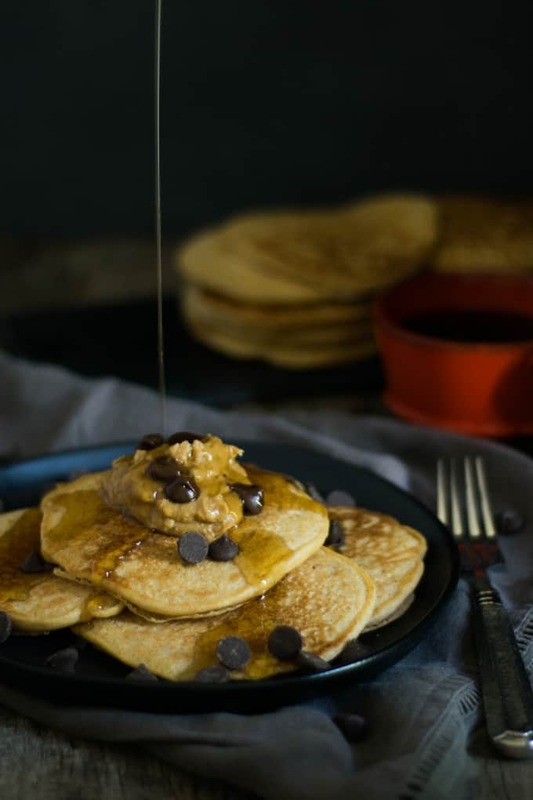 And, peanut butter and pancakes do it better than most things. These pancakes have quickly become our family’s new go-to pancake. My kids love eating these with chocolate chips, bananas, and even strawberry jam. Personally, I prefer a little dab of peanut butter on top followed by non-dairy chocolate chips and a bit of maple syrup. But, even without all the extra fun stuff, these things are perfect all by themselves. 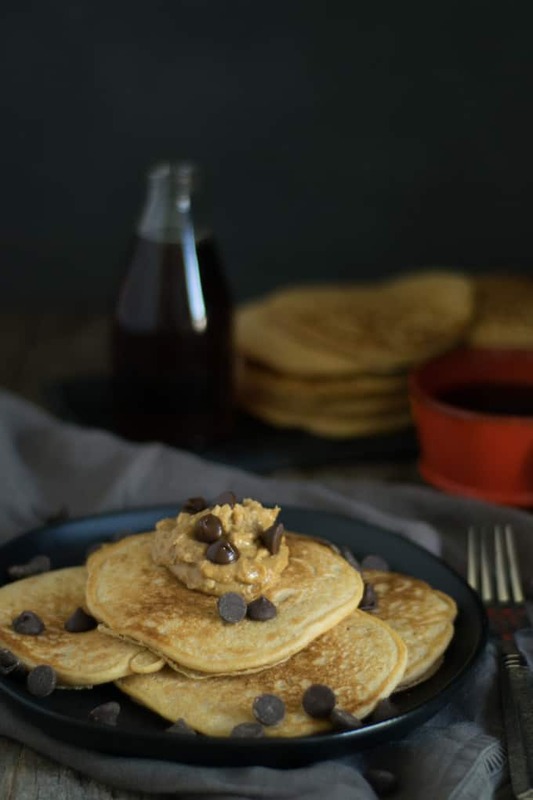 I’m convinced these Homemade Peanut Butter Pancakes are going to ROCK YOUR WORLD! They’re hearty, fluffy, delicious, healthy and super simple to make. Are you into pancakes? 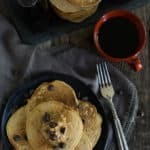 Then be sure and check out my Five Ingredient Easy Vegan Pancakes and Wicked Blueberry Pancakes. And, if you like things with peanut butter, you should try my Grilled Peanut Butter Jelly & Banana Sandwich, Chocolate Peanut Butter Hummus, and amazing Five Minute Peanut Dipping Sauce. If you make this recipe I want to know. So, please leave a comment below with a star rating. And, be sure and share a picture on Instagram with the hashtag #shaneandsimple. I want to see your work. Enjoy! Throw that box of pre-made pancake crap in the trash! 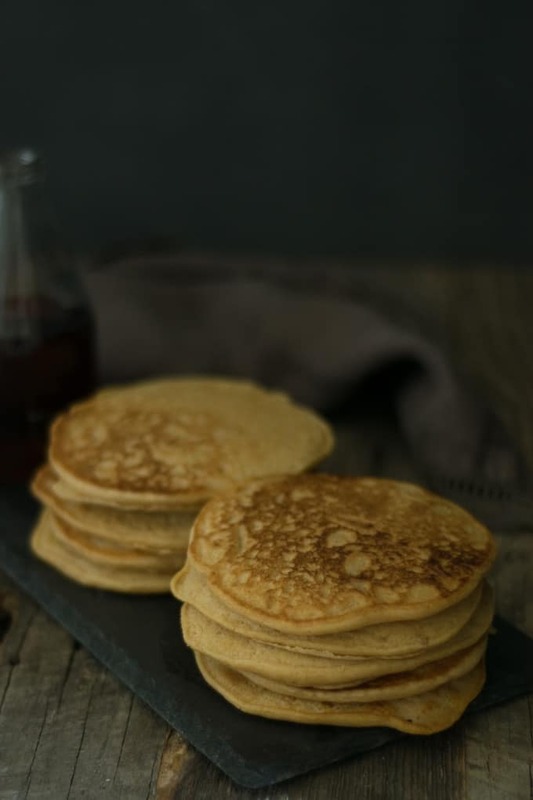 These Homemade Peanut Butter Pancakes are way better and super easy to make. Made with whole ingredients they’re light, fluffy, healthy and absolutely delicious. Preheat nonstick skillet over medium heat. If you are using an electric griddle, heat to 350 degrees. Next, make the vegan buttermilk by adding 2 Tbsp. of white vinegar to the almond milk. Whisk lightly and let it set while you prepare the other ingredients. If you don’t have white vinegar, apple cider vinegar or lemon juice works just as well. Over a large mixing bowl sift together the flour, baking powder, organic cane sugar, and salt. Pour in all your wet ingredients, except for the peanut butter, and whisk just enough to combine. Add the peanut butter and whisk to a “fluffy” consistency. Lightly spray your skillet or griddle with cooking spray and begin making the pancakes. 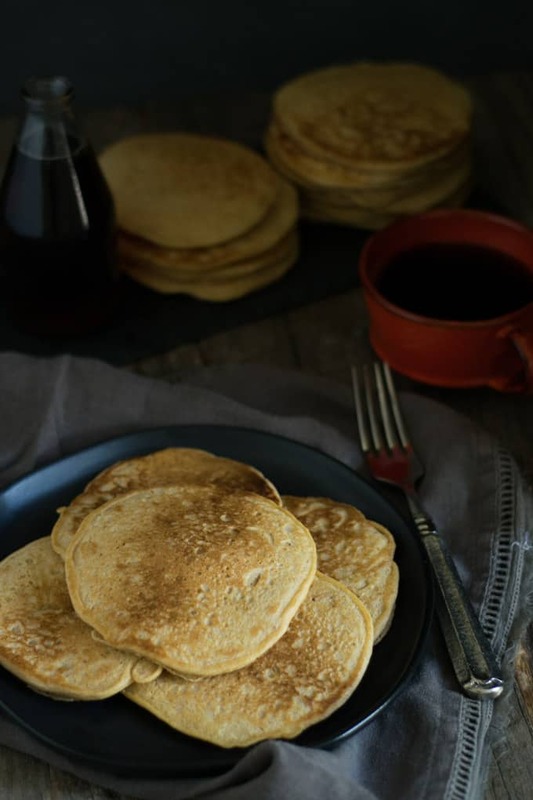 I use 1/4 cup of batter per pancake, but you do your thing and make them as big as you want. DON’T MESS WITH THE PANCAKES WHILE THEY COOK. JUST CHILL OUT! Think about your woman, your dude, or maybe your dog. But, leave the pancakes alone to cook. Once the pancakes start to brown on the side and bubble just a bit in the center, then you can flip. And, you only flip once. That’s it! Finally, plate these bad boys ’cause it’s time to eat! 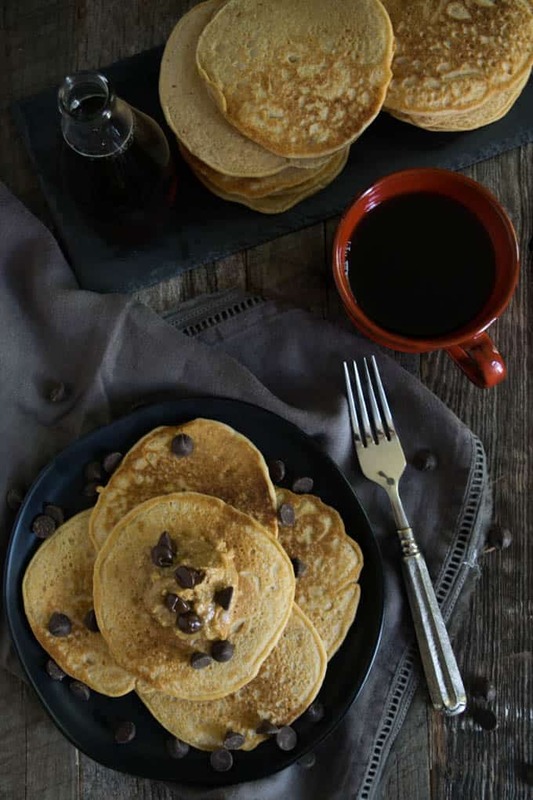 Top them with maple syrup, chocolate chips, bananas or just eat them plain. Enjoy! These were absolutely delicious! Just the right amount of peanut butter. what would you use to make these gluten-free? Naomi, I would try and use this Bob’s Red Mill Gluten-free flour. Let me know how it turns out.